The Bangladeshi PM’s visit comes amid a push by India to increase its connectivity with eastern neighbors. In the second week of April, Bangladeshi Prime Minister Sheikh Hasina will be visiting India, her first state visit to Bangladesh’s neighbor in seven years. In a related development, the security chiefs of the Bay of Bengal Initiative for Multi Sectoral Technical and Economic Cooperation (BIMSTEC) group held a recent meeting. These developments, one bilateral and the other regional, are interconnected and both have the potential to further improve India-Bangladesh ties. 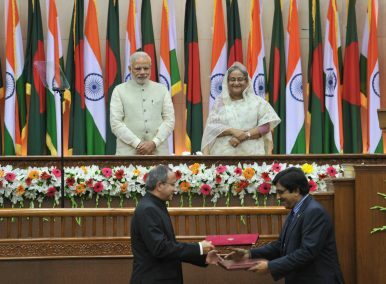 India-Bangladesh relations have been on an upward trajectory in the last three years. Hasina’s visit is expected to deepen the relationship. As India further strengthens its ties with BIMSTEC and Southeast Asian nations, India-Bangladesh bilateral relations will assume even greater importance. Complex history and geography have influenced India-Bangladesh relations since the birth of Bangladesh as an independent state. Bangladesh is surrounded by India on its eastern, northern, and western borders, and the India-Bangladesh border is the longest India shares with any of its neighbors. The boundary problems between the two states have been laid to rest only recently. In the past, Bangladesh has accused India of having a big brotherly attitude toward it while India accused Bangladesh of acting against Indian interests by giving sanctuary to insurgents active in its northeastern region. Hence, bilateral relations were not always cordial between the two neighboring states, but recent years have changed the tone and tenor of the relationship for the better. An appreciation of common interests and working on mutually beneficial initiatives has allowed the two neighbors to improve bilateral ties in recent times. Both states are members of the South Asian Association for Regional Cooperation (SAARC) as well as BIMSTEC. Bangladesh even hosts the headquarters of BIMSTEC, while India is a key member in both these regional groups. This emerging regional context brings even greater salience to India-Bangladesh bilateral ties. The nature of their relations could contribute to the success or failure of these regional and subregional arrangements. India and Bangladesh have common stakes in the security and prosperity of the eastern subcontinent. Greater connectivity between the two states in the electricity, natural gas, cyber, and transport sectors could bring more benefits to the peoples of both countries. Some of these initiatives are already underway. India supplies some power to Bangladesh and has been working on increasing cyber connectivity between the two states. The transport sector is a key area of partnership as well. All these efforts will allow citizens of India’s landlocked northeastern states to access Bangladeshi infrastructure for greater connectivity, while Bangladesh could connect with the Himalayan states of Nepal and Bhutan via India. This is the logic behind the Bangladesh, Bhutan, India, and Nepal (BBIN) transport corridor. At the 2014 SAARC summit in Nepal, Pakistan blocked greater connectivity initiatives in the SAARC region. But India and Bangladesh, along with Nepal and Bhutan, have moved forward on the proposal on their own. They have signed a subregional arrangement that is now known as the BBIN Motor Vehicle Agreement. It is expected to allow for the seamless movement of traffic among the four countries. The agreement has the capacity to increase trade flows as well as the movement of people between the four participating states. In addition to this, India and Bangladesh have also been part of two other interesting proposals. One is the BCIM economic corridor, involving Bangladesh, China, India, and Myanmar. This project could connect southeastern parts of China with the eastern subcontinent, bridging China, South Asia, and Southeast Asia like never before. Another project idea is to build a gas pipeline from Myanmar to India via Bangladesh. As Myanmar and Bangladesh are rich in gas deposits and India is a ready market, this pipeline could be a game changer in the geopolitics of the Bay of Bengal region. But both these initiatives have yet to take off. India is now channeling greater energy toward engaging the members of BIMSTEC in the regional framework. Prime Minister Narendra Modi hosted the leaders of BIMSTEC in Goa recently. BIMSTEC members are also invited to attend the upcoming counter radicalization conference that India will be hosting in 2017 with ASEAN. As India focuses on BIMSTEC and ASEAN for greater regional cooperation, India-Bangladesh dynamics will assume a central place in the emerging geopolitics of the Bay of Bengal region. It is in this context that the coming visit of the Bangladeshi prime minister to India will be important. Sankalp Gurjar is a Ph.D. candidate at the Department of International Relations, South Asian University, New Delhi. "With Pakistan perennially playing spoilsport in SAARC, BIMSTEC can be expected to play a greater role."